Australia’s unemployment rate rose slightly, to 6.3 per cent, in November, despite the creation of more than 40,000 jobs during the month. The Australian Bureau of Statistics said on Thursday that the number of people employed rose by 42,700 to 11.64 million in November, against market expectations of 15,000 newly employed and compared with a revised 13,700 in October. The participation rate climbed from 64.6 per cent of the population to 64.7 per cent. It was the fastest pace of jobs growth since March 2012, but also the highest unemployment rate for more than 12 years. 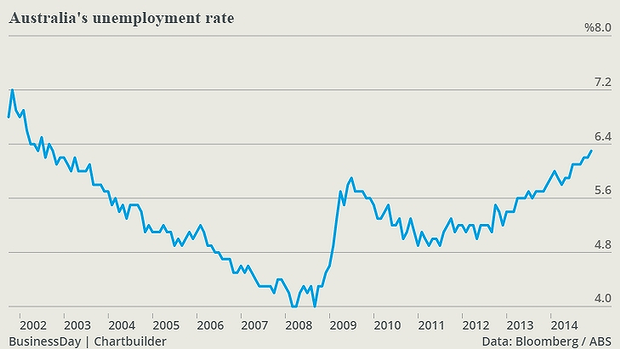 Before rounding off, the official unemployment rate climbed from 6.25 per cent to 6.26 per cent. The figures were much better than expected, and the Australian dollar spiked about half a US cent before retreating a little to settle around US83.60 cents. However, the ABS said many of the new jobs – in fact 36,400 – were part-time positions for women. A total of 23,300 men were newly employed, offset by a net fall in overall jobs for women of 21,400. Total full-time employment increased by 1,800 jobs, while the aggregate monthly hours worked dropped 4.4 million hours, or 0.3 per cent. ANZ said the figures were “slightly better than the market expected, and suggested labour market conditions improved modestly in November”.